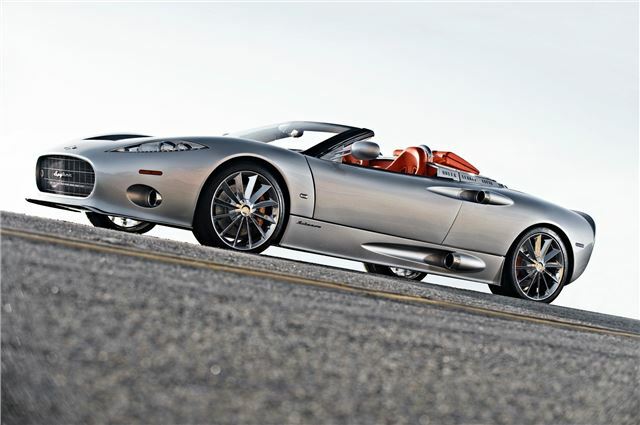 Spyker has unveiled the C8 Aileron Spyder concept at MPH The Prestige and Performance Motor Show at Earls Court in London. Powered by a 400hp 4.2-litre V8-engine, the Spyker C8 Aileron Spyder concept - designed in The Netherlands - illustrates the aircraft-inspired detailing which the Spyker brand has become renowned for. From its jet engine-inspired air intakes to its exterior mirrors mounted on two turbine fan blades and unique 10-blade 19-inch Rotorblade alloy wheels, the second-generation Spyker C-line sportscar is inspired by the jet turbine era of aviation. The C8 Aileron Spyder shares its all-aluminium space frame structure and new suspension system with the C8 Aileron coupe, while its aluminium superformed body - with minimal ‘shut' lines - is finished by hand by expert craftsmen. The interior features Spyker's trademark diamond-stitched quilted leather upholstery. The aviation theme continues with brushed aluminium dashboard and turbine-style air vents, while the polished aluminium Chronoswiss dash toggle switches and dials complement and the ultra-exclusive Spyker motoring experience. The C8 Aileron Spyder sports a high-quality canvas soft-top with a glass rear windscreen, which retracts electro-hydraulically out of sight. Its aluminium tonneau, with two buttresses upholstered in quilted leather matching the car's interior, features the company's motto ‘Nulla Tenaci Invia Est Via': for the tenacious, no road is impassable. An aluminium luggage rack is mounted immediately behind the roll hoops, on which a purpose-designed wing-shaped aluminium, leather-trimmed luggage case can be strapped. The Spyker C8 Aileron Spyder, along with short wheelbase C8 Laviolette and C8 Spyder models, features at MPH The Prestige and Performance Motor Show at Earls Court, London until Sunday 7 November.